Why Choose Kertes Homes as Your Green Home Builder? Kertes Homes at the Lakes of Orange have achieved the highest energy efficiency rating of any builder in Northeast Ohio. The difference is experience. Kertes Homes has more experience with green building standards and materials than any other builder in the area. 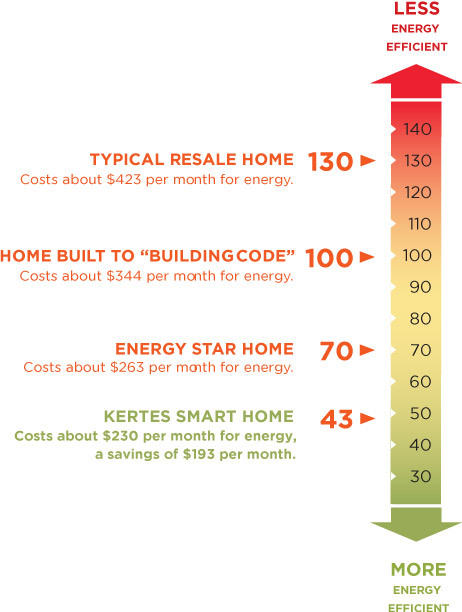 Kertes Homes are designed and constructed to lower your monthly energy bills and provide the lowest ongoing maintenance costs. The Home Energy Rating System (HERS) is an independently tested industry standard for measuring energy performance. The lower the rating, the lower your energy cost, and the lower your impact on the environment. A healthier home environment through improved indoor air quality. A more comfortable home due to fewer temperature variations. A reduction in the use of natural resources. Lower energy bills. With better insulation, tight ductwork, sealed doors and windows, efficient heating and cooling, efficient lighting and appliances you’ll enjoy lower electric and gas bills. Lower water bills. With low flow faucets and showerheads, dual flush toilets you’ll enjoy lower water bills. Healthy indoor air quality. We use paints, adhesives, sealants and finishes are that are low VOC. More durable. We select high quality building products that last longer than comparable products. Over time, you save money in maintenance and replacement costs. Increased the value of the home. Studies have shown that a building’s value increases by 3-5 percent when it is green.